Dogs frequently present with masses along the eyelid margin. Benign canine eyelid masses outnumber malignant ones at a ratio of 3 to 1. Most of these masses are tumors of the meibomian glands that line the eyelid margins and normally supply lipids (meibum) to the tear film. As dogs age and develop numerous sebaceous skin tumors, they are also more likely to develop these minimally invasive meibomian tumors. Meibomian tumors of the dog include epithelioma (originating from the epithelia lining the duct of the gland), sebaceous adenoma, and acinar adenocarcinoma (originating from the gland itself). These masses are typically nodular with grey or pink coloration and usually emanate from the palpebral conjunctiva, outer skin of the eyelid, or most commonly the eyelid margin. Any eyelid mass lacking these characteristics necessitates a preoperative biopsy or cytology to rule out more aggressive tumors (e.g. mastocytoma, squamous cell carcinoma, malignant melanoma, or epitheliotropic lymphoma). Aggressive eyelid neoplasms also require preoperative staging, advanced surgical planning, and/or chemotherapy prior to any resection. Most canine eyelid masses are benign. However, they can rub against the cornea resulting in chronic irritation, discomfort, and even ulceration. Some cause corneal ulcerations indirectly by preventing the proper juxtaposition of the closed eyelid margins, or lead to abnormal spreading of the tear film. Adenomas, adenocarcinomas, and epitheliomas can cause impaction of other meibomian glands leading to painful infections. A sty (hordeolum) is an infected meibomian gland whereas a chalazion is the mass of infected tissue (typically a granuloma) that develops around it. Large meibomian masses and chalazions may become friable and spontaneously bleed. Eyelid masses should be removed early in their development to generate the smallest surgical defect. Masses exceeding 5 mm in length can cause pressure necrosis of eyelid muscles and stroma. Resection of these large masses without secondary closure will generate a notch in the eyelid. Notches within the lower eyelid usually have few consequences besides cosmetic ones. Upper eyelid notches may result in secondary keratitis, corneal ulcerations, and even loss of the affected eye. Masses generating defects equal to or exceeding 5 mm should therefore be resected and the defect closed with sutures. Please note that larger eyelid masses (exceeding 5 mm) can be treated with cryotherapy or CO2 laser, but it is the length of the resultant defect of the eyelid margin that determines the necessity of a sutured closure. Small masses, that will not result in significant destruction of an eyelid margin, can be removed by laser of cryogenic therapy while a dog is under general sedation with lidocaine blocking the sensation of the eyelid. These procedures can be performed on masses extending from the meibomian gland that have not altered the eyelid margin. The mass is first isolated with a chalazion clamp and curettaged from the bulbar side of the eyelid. Surrounding tissue is then treated with cryogenic therapy to destroy any remaining cells that could generate a recurrence of the mass. Resected tissue is biopsied to confirm its classification (typically benign). Alternatively, under sedation and lidocaine blocks, small eyelid masses can be ablated with a CO2 laser and allowed to heal by secondary intention. In either procedure the cornea must be protected with an eye shield to prevent inadvertent thermal damage. Benign eyelid masses have been reported to recur in 15% of patients following cryotherapy and debulking in an average time of 367 days. Cryotherapy kills cells through the rapid formation and damage caused by intracellular ice crystals. Benign tumors (adenomas, epitheliomas, and papillomas) rapidly necrose when brought to -20 to -30 °C, whereas malignant adnexal tumors must be brought to -50 °C for similar effects. Postoperative occurrences of hemorrhage, edema, and depigmentation are expected following cryotherapy. Typically, bleeding begins during or immediately following surgery, but edema will resolve within 5 to 7 days. Depigmentation in the area of mass destruction usually occurs within 6 months postoperatively. Benign masses have been reported to recur in 5% of patients within 3 months of excision or ablation with a CO2 laser. In these studies, masses less than 0.5 mm in length were ablated and larger masses excised. The CO2 laser emits a coherent light beam of 10,600 nm which vaporizes the intracellular and extracellular fluid of cells. In addition, the laser can seal and coagulate small blood vessels for a hemorrhage-free surgery. The CO2 laser is very precise and requires destruction of cells peripheral to a visible mass to assure complete ablation. Char generated by laser therapy must be removed to prevent corneal and conjunctival irritation. Typical post-operative complications are swelling and exudation, but not hemorrhage. One drawback to CO2 laser ablation is that destructed tissue cannot be submitted for biopsy. If you have any further questions regarding laser ablation, cryogenic therapy, or resection of eyelid masses, please feel free to consult with a veterinary ophthalmologist. Figure 1. 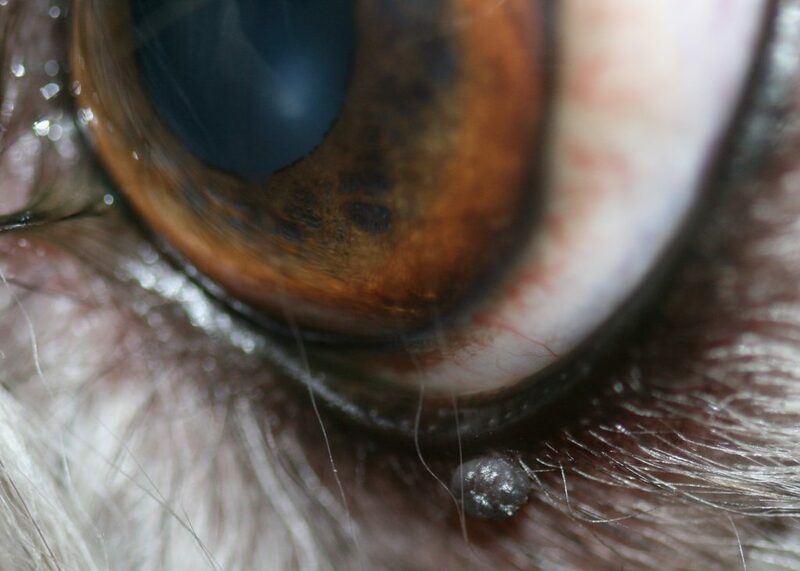 A small lower right eyelid mass (without involvment of the eyelid margin) in a 7-year -old m/c Shih Tzu that can be destroyed by cryogenic therapy or CO2 laser ablation.